As part of the 2015 POPSUGAR Insights Food study, we surveyed female visitors to POPSUGAR to better understand their grocery-shopping behaviors. One of the questions we included was a question regarding how women see themselves when it comes to their taste and interest in food. We created a list of diverse segments and asked women to pick a word or phrase that most closely describes themselves. 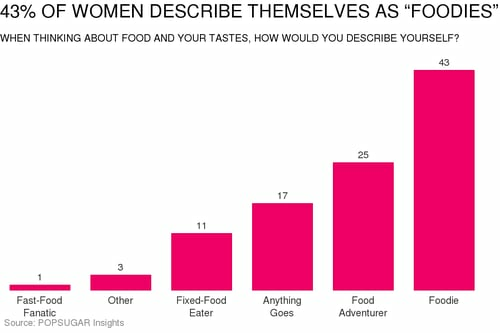 Forty-three percent of women described themselves as "foodies," meaning they are lovers of "high-quality foods," and 25% of women selected "food adventurers," meaning they love to try different types of foods. Seventeen percent of women selected "anything goes," meaning they will eat anything! Eleven percent of women identified themselves as "fixed-food eaters," meaning they only like certain foods and tend to stick to them, while 3% of women identified themselves as "flexitarians."